March was another intense month in the world of autonomous driving, with some critical safety setbacks, government feedback and advancements — like the London GATEway pods (pictured above). Earlier this month, a self-driving Uber vehicle with a human backup driver inside was on a test run outside Phoenix when it struck and killed a pedestrian who was crossing the road. In response, the state of Arizona — which had been an incredibly fertile ground for driverless vehicle experimentation in recent months — took action by suspending Uber’s privileges for testing driverless vehicles. Even before the accident though, Uber’s driverless technology appeared to have issues. As the New York Times reports, Uber was struggling in Arizona to meet its target of 13 miles per needed intervention from the human driver onboard. For comparison, another self-driving car company, Waymo, said that in tests on roads in California last year, its vehicles went an average of around 5,600 miles before an intervention was needed. There’s also news from Reuters that Uber potentially reduced the number of LIDAR sensors on its vehicles when it swapped out its fleet in 2016. As local police officials and investigators from the National Transportation Safety Board analyze the Uber accident, hopefully their findings will help other autonomous vehicle companies strengthen their safety technologies as well. It’s been reported Uber has already reached a settlement with the family of the woman killed in the crash. On March 1, a U.S. Department of Transportation “Listening Summit” around development of regulations and policies related to autonomous vehicles was held in Washington, DC. The meeting was attended by representatives from auto manufacturers, technology companies, road safety advocates and policy makers, and featured remarks from the likes of U.S. Secretary of Transportation Elaine Chao. While there’s still a variety of questions about how autonomous vehicles will be regulated, in a summary of the event (which you can watch here), The Verge reports that UDOT did provide an abundance of answers. Still, UDOT did say to expect the release of updated federal guidance, dubbed “AV 3.0,” for manufacturers and states seeking to deploy self-driving vehicles as early as this summer. 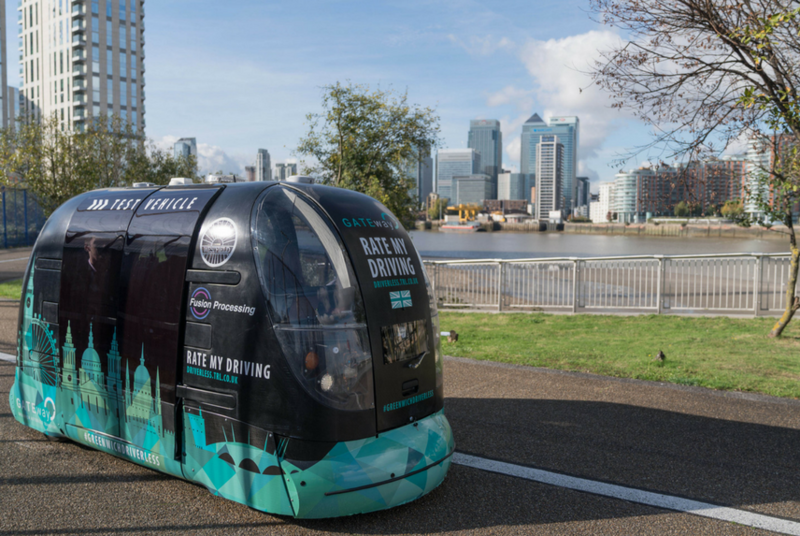 For the past year, the city of London has been trial-testing driverless shuttles, nicknamed “pods,” using a mix of public and private funding. As opposed to self-driving cars, these pods — born out of an effort called the GATEway Project — have been described as being more capable of navigating the windy streets of Europe. Despite the variance of obstacles, The Verge notes, London’s pods have been reliably safe, which may have something to do with their composition. They’re round, with no hard edges, and they don’t move faster than 10 m.p.h. There’s also an engineer always onboard who can take control in the case of a crisis. With no steering wheels, the pods were created by British companies Westfield Sportscars and Heathrow Enterprises, and are powered by Fusion Processing technology that combines GPS with radar and LIDAR. This allows the pods to detect and navigate objects in their path and operate at night and in adverse weather conditions. While the pods wouldn’t necessarily be a reliable way to zip around cities quickly, one of the potential use cases is that they could serve as shuttles to other forms of mass transit.